From Kyoto to Kuala Lumpur via Chubu International Airport. Visit to Dr. Adi Setia, Dr. Sani Badron at International Islamic University (UIA) and investigation of historical materials at the university library. Visit to Dr. Uthman el-Muhammady, Dr. Baharudin Ahmad, Dr. Osman Bakar at International Institute of Islamic Thought and Civilization (ISTAC) and investigation of historical materials at the Institute library. Visit to Mr. Abdullah Sani Usman at Malaysia National University (UKM) and investigation of historical materials at the university library. From Kuala Lumpur, Malaysia to Istanbul, Turkey. Investigation of historical materials of Sufism during the Ottoman period at Center for Islamic Research. Suleymaniye Library, Istanbul University Library and Bursa Inebey Library. Meeting with Prof. Mehmet Bayrakdar (Professor of Faculty of Theology, Ankara University) and Prof. Mehmet Sait Recber (Associate Professor of Faculty of Theology, Ankara University) for the promotion of the international cooperation from August 16 to 18. From Istanbul to Kuala Lumpur. Collection of Academic Materials in Kuala Lumpur, departure from Kuala Lumpur. Arrival at Kansai International Airport, return to the university. In Turkey I had the chance to talk about promoting the international academic cooperation with Prof. Mehmet Bayrakdar and Prof. Mehmet Sait Recber of Faculty of Divinity, Ankara Univ, with which we have already signed MOU. I had also the chance to talk with the following researchers in Malaysia to enforce the international cooperation. Dr. Adi Setia, Dr. Sani Badron of International Islamic University (UIA), Dr. Uthman el-Muhammady, Dr. Baharudin Ahmad, Dr. Osman Bakar of International Institute of Islamic Thought and Civilization (ISTAC), and Mr. Abdullah Sani Usman at Malaysia National University (UKM). I investigated the materials of the School of Ibn Arabi in Malaysia and those of Sufism during the Ottoman Empire in Turkey. In Malaysia I carried out philological research at International Islamic University (UIA), International Institute of Islamic Thought and Civilization (ISTAC), and Malaysia National University (UKM). 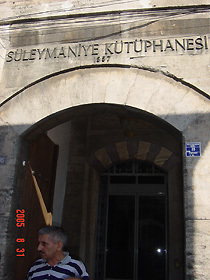 In Turkey I carried out philological research at the Center for the Islamic Research, Suleymaniye Library, Istanbul University Library and Bursa Inebey Library.Oriental Institute. In Tanzania I interviewed the head of Shadhili Order and carried out philological research in some libraries. We are establishing the academic human networks in Middle East based on West Asian Field Station. In addition to this, I also carried out the academic researches in Malaysia with the help of the students who are working energetically based on Kuala Lumpur Field Station. We should aim at the further academic cooperation between the field stations in Africa, South Asia, Southeast Asia and West Asia. 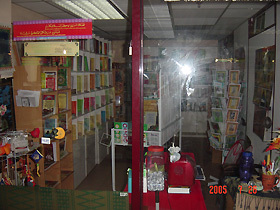 “Islamic bookshop in Kuala Lumpur” This bookshop sells many books in Jawi side by side with those in Malay. Jawi is Malay language written with the Arabic letters and children are studying the Jawi in Malaysia. Many books on Sufism, which is my speciality, have been written and they circulate among the people even nowadays. “Entrance to Suleymaniye Library, Istanbul” This is the second oldest library which was erected in 1557 (during the period of Ottoman Empire) as you can see in the photograph. It contains as many as 65,000 manuscripts written in Arabic, Persian, Ottoman Turkish etc. You can read the manuscripts themselves (not the microfilm or the photocopy) which are brought from the library stacks. Recently the photolibrary project in CD-ROM is promoted as a national project and the library is becoming more friendly to the users.